Welcome to the 2017 FORMULA 1 UNITED STATES GRAND PRIX! The biggest celebration of the year deserves an equally big blog post. 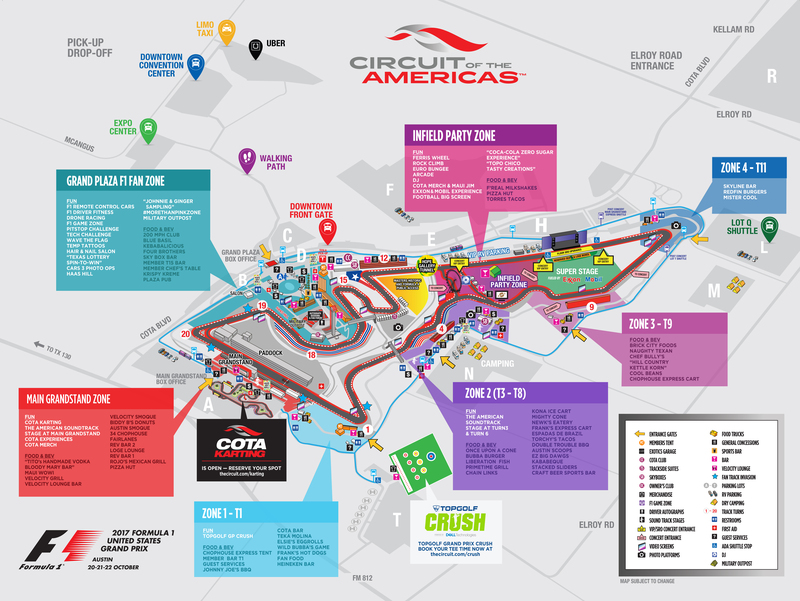 Below you'll find your map to an incredible weekend at Circuit of The Americas. Get the most out of your USGP experience with the freshly updated COTA App. With the race schedule, GPS map, food options, entertainment locations, chances to win prizes, unique photo frames and more, it's your easy reference guide to the USGP in the palm of your hand. The COTA App will continue to be updated throughout this week. Update the app under settings on Friday to ensure you have the most up-to-date information. Click the image below to enlarge and view entire map. Please note it is a large file and may take time to load. Please note that any vehicle without a valid, purchased parking pass will be unable to access COTA Blvd during the course of the event. If you did not purchase a parking pass, please refer to the COTA Shuttle information below for transportation options. Traveling SH130, or SH183, take FM812 Exit (Exit 453) and travel east to Circuit of The Americas Boulevard (South Entrance). For Lot T, continue of FM812 past COTA Blvd until Lot T entrance. Traveling SH130 or FM973, take Pearce Lane Exit (Exit 450) and travel east to Kellam Road. Turn right on Kellam Road and travel south to COTA Blvd (North Entrance). Via SH71, turn right on Kellam Road and travel south to COTA Blvd. Traveling SH130 or FM973, take Pearce Lane Exit (Exit 450) and travel east to Kellam Road. Turn right on Kellam Road and travel south to Elroy Road. Lots L/M will be past the bend on your right. Lot N will be past Lots L/M on your right. Saturday: 7:00 a.m. - 11:59 p.m.
Catch a safe ride to the USGP with Uber! Enter promo code RIDE2COTA for $20 off your first ride. All of these options should use the McAngus Road drop-off and pick-up area (Yellow Lot). Formal Grand Prix opening ceremonies will begin at 12:30 in the afternoon on Sunday, October 22. Cheer on your favorite drivers when they’re each given their moment in the spotlight, introduced by legendary announcer Michael Buffer. The cheerleaders of Texas’ most successful football franchise will join the F1 drivers on the grid before the Grand Prix begins. Guests will be treated to a special performance from the acclaimed band, known for its unique style for over 80 years. The National Anthem will be performed by Retired Naval Petty Officer, Generald Wilson. Look to the sky just before lights out. Join the celebration on the track once the Grand Prix has concluded on Sunday and the winner is raising his trophy. Autograph sessions are open to all guests. Access to the drivers for an autograph will be on a first-come, first-served basis at the floor section of the Austin360 Amphitheater, directly in front of the stage. Please reference the online schedule, or the schedule within the app for the latest updates. Join us at Austin360 Amphitheater on Saturday for a special Q&A with the F1 drivers and team personnel. Get the answers to your burning F1 questions. Fan Forum: Saturday, 1:30 p.m. to 2:30 p.m. 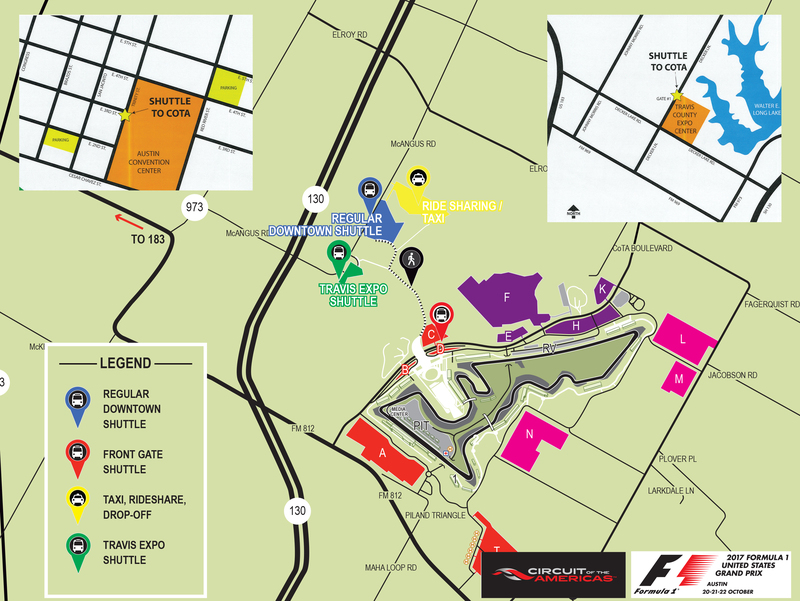 Learn more about Formula 1 from the pros throughout the weekend at the Austin360 Amphitheater. Future of Formula 1 Talk: Friday, 12:30 p.m. to 12:50 p.m.
F1 Fitness Talk: Friday, 4:10 p.m. to 4:30 p.m.
Ross Brawn & Chase Carey Talk: Saturday, 3:10 p.m. to 3:25 p.m. The Grand Plaza will be a hub of activity and entertainment during USGP weekend. With everything from a stage presenting live music from local musicians throughout Saturday and Sunday to roaming entertainment, the Grand Plaza is a must-see area during the weekend. You will find many food options, sampling from Johnnie Walker, event merchandise and much, much more! For the first time, the Formula 4 and Masters Historic Racing Paddock is open to all guests! Get up close and personal with the stars of tomorrow and the cars of yesterday. Hop in the driver's seat and see how you hold up against the pros with F1 2017™, try your hand at an F1 Pit Stop, and much more. There's fun for the whole family while watching the on-track action or wandering around the Circuit. Bring the kiddos out for fake tattoos, face painting, remote control cars, nail art, and more. Enjoy the race with fellow fans excited to cheer on home-country heroes, Haas F1 Team! Haas Hill is situated between Turn 18 and Turn 19 with great views of the on-track action and a whole lot of red, white, and blue pride! Catch a band throughout the day Saturday and Sunday on one of the many stages around the Circuit at the Grand Plaza, Main Grandstand, Turn 3, Turn 7 and the Infield Party Zone. Don't leave the speed to the pros this year. Our brand new karting track in Lot A will make its debut during the USGP for you to put the pedal to the metal. To partake, you must purchase track time for $30 in advance online starting Wednesday, October 18. No walk-up sales. At Turn 6, Turn 11 and Turn 16 find unique photo ops from Fujifilm. Plus, if you download the COTA App and participate in the Photo Challenge, you’ll have a chance to win a Fujifilm SQ10 to document the rest of your USGP weekend at COTA! Take a trip through Tunnel 2 (under the track between Turn 11 and Turn 12) to see an incredible mural installation by Hope artists, a local non-profit that connects creatives with causes through projects and events driven by inspirational, positive and educational messaging. A few uplifting Hope art pieces will also be scattered throughout the Grand Plaza. Party in the infield near the Super Stage on Saturday and Sunday with carnival rides, a DJ spinning tunes, a rock climbing wall and bungee trampoline. Food trucks, including Pizza Hut, will be positioned around the infield with picnic tables to let you kick back while watching the on-track action from inside the track. You can also enjoy samples from our friends at Coca-Cola and Topo Chico, or have fun in the Exxon Mobil Interactive Zone. Snap a selfie with Lightning McQueen, Jackson Storm, Cruz Ramirez and Miss Fritter of Pixar's and take home some Cars 3 swag including window clings, downloads and mini posters. Located in the Grand Plaza. Tesla is bringing their first-ever mobile gallery to the USGP. Pulled by Telsa Model X SUV, this custom Airstream trailer is retrofitted to showcase all interior and exterior vehicle options. Explore the mobile gallery and experience the groundbreaking features of Model X and Model S near the COTA Club this weekend. COTA salutes our armed forces with a shady tent near Turn 18 for our military members and their guests. If you are a member of the military, present your Military ID to the attendants at the tent. You and your party will be able to enter and enjoy the shade and private bar within. Take a trip to the top of COTA's 25-story Tower to the glass-bottomed observation deck to see the stunning 360 degree view of the Circuit from a bird's-eye-view. Tower Observation Deck tickets are offered at the base of the Tower during USGP weekend for $30 per person, or upgrade your ticket to skip the line an enjoy a champagne toast at the top. Bring your headphones and catch live audio of the race through the COTA App. To view the full schedule of coverage, check the COTA App later this week. 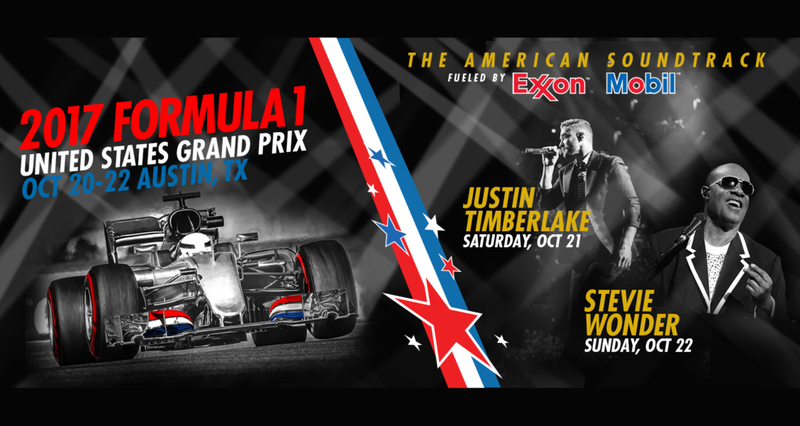 Justin Timberlake and Stevie Wonder will take to the COTA Super Stage in the Circuit's infield between Turn 11 and Turn 12 for all F1 USGP guests to enjoy. On Saturday, The Shadowboxers start the show at 6:30PM, followed by Justin Timberlake. After the Grand Prix on Sunday, Stevie Wonder is set to hit the stage at 6:00PM. If you have yet to purchase a music upgrade to be as close as possible to the stage, there are only a few remaining for Stevie Wonder's concert. Buy your music upgrade online now to enjoy Stevie Wonder’s concert from a dedicated standing pit in front of the stage. You can also swing by either box office or the Experience Upgrade Tent in the Grand Plaza to upgrade when you get to COTA. Gates to the Circuit open at 8:00 a.m. Saturday and 8:30 a.m. Sunday. 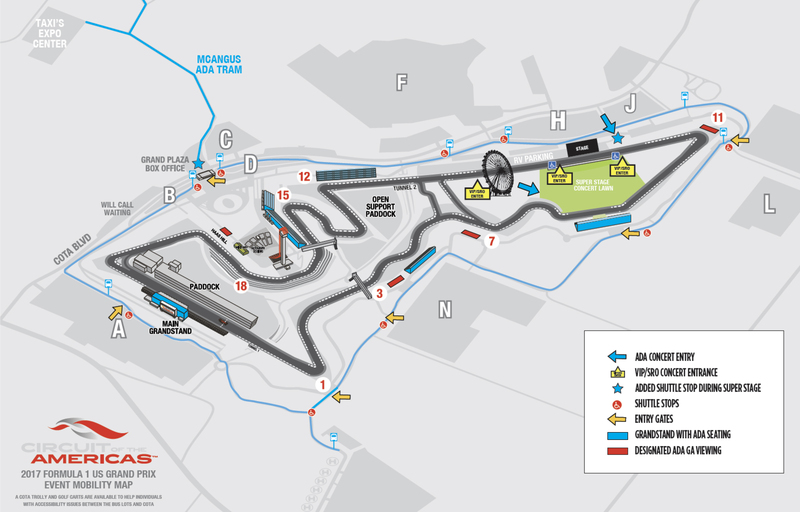 The gates to the Super Stage are tentatively slated to open at 6:30 p.m. on Saturday and 5:00 p.m. on Sunday, however these times are subject to change due to the logistics of quickly converting a Formula 1 track to a concert venue. General Admission - All USGP guests without a concert upgrade will enter the Super Stage area from the Infield Entertainment Zone area, Turn 9, Turn 11 (see pink arrows on the map above). Music Upgrade - Standing Room Only and Bleacher Upgrades will enter the track near Tunnel 2 (see yellow arrows on the map above). If you have a concert upgrade and are coming from near Turn 9 or Turn 11, you may enter the festival lawn, head to the front of the lawn and proceed down the stairs to the upgrade section after presenting your upgrade ticket to the staff at the stairs. ADA Assistance - If you require ADA assistance, get dropped off via shuttle between Lot H and Lot J, and enter the Super Stage area (see the ADA logo to the right of the stage). Shuttles to the Super Stage - Shuttles will run on a continuous loop around the Circuit to take guests to the Super Stage area from around the track. See the three routes listed above, with stops marked with yellow dots. Hop on a shuttle and get dropped off at one of the entry points to the Super Stage (Tunnel 2, Turn 9 or Turn 11). ADA Shuttle Info - All shuttles running around the Circuit are ADA accessible. Take one of the shuttles from your location to the Super Stage. Our guests' safety is of the utmost importance. Please adhere to safety guidelines and leave all prohibited items at home. Visit our online FAQ to get full details. 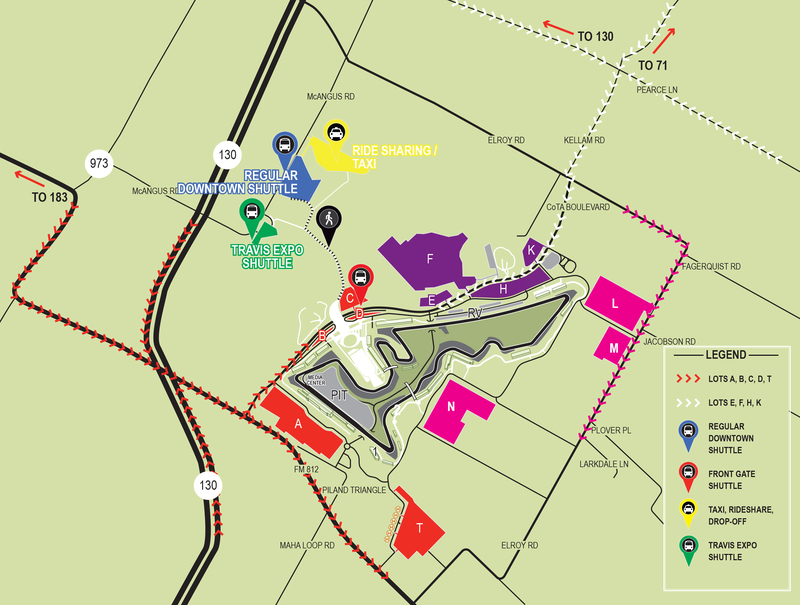 All shuttles running on COTA's property are ADA accessible. If you have any ADA-related questions, or require assistance while on site, please visit one of the orange Guest Services tents at the Main Grandstand, Turn 1, Turn 3, Turn 9, Infield Party Zone and Grand Plaza. Below are all the internal shuttle routes that are ADA accessible, as well as General Admission areas designated for ADA viewing. We look forward to sharing the biggest party of the year with you, and welcome you to share your experience with us on social media throughout the weekend with #COTA.